Helping actors, storytellers, and solo performers to conquer the stress of auditioning or performing through the meditative techniques of Spolin improvisation. Encouraging actors to find intuitive, physical, and spontaneous ways into character, creating fresh and unexpected takes on their roles. Working with actors, storytellers, solo performers, and theater companies to create/devise original material for performance using a combination of writing exercises and improvisational methods. 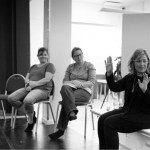 Working with theater companies and directors during the rehearsal process to help them bring scripted material vividly to life through improvisational techniques.